Your automatic garage door is comprised of many different mechanical and electrical components, every single one of which plays an intricate and integral role to ensure the proper operation of the system as a whole. That's why a lot of experience and skill are required in order to be able to safely and correctly fix any problem that manifests. Our technicians are here for you when you need us. The springs that your garage door relies upon to support its weight must be in a great working condition at all time. When these crucial components break, they can seriously injure any person standing nearby, and may even bring your entire door tumbling down. Dealing with a broken spring, either of the torsion or the extension type, is highly dangerous, and the replacement process should only be performed by specialized technicians. Unfortunately, the problems that can inflict your garage door don't end with the springs. Another piece of hardware that can breakdown are the tracks. These components can break, become blocked by debris and even get misaligned. Not to worry, though. Our technician can replace, unblock and realign them for you. Whatever you need, we can provide. The opener is the motorized unit that makes your door's action automated. As a result, there are a slew of different issues it could suffer from. Worn out motor gears are one example, a fried circuit board and a broken chain (if you have a chain-drive opener, that is) are two more. Regardless of what's causing the problem, rest assured that our team can quickly fix it for you. No matter of how complex the problem you're experiencing seems to be, remember – we are a team of highly experienced and skilled technicians. No issue is too big for us to handle. Contact Garage Door Repair Libertyville today. 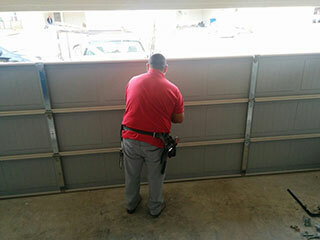 Our professional team is the one to call when you have a problem with your home's garage door. With years of experience working with local customers, our knowledgeable experts guarantee that your door will operate like new for years to come. Contact us today when you need the best services at the lowest prices in town. Thank you for choosing Garage Door Repair Libertyville! One of our experts will be in touch soon. Feel free to browse our website for FAQ, tips and more useful information in the meantime!